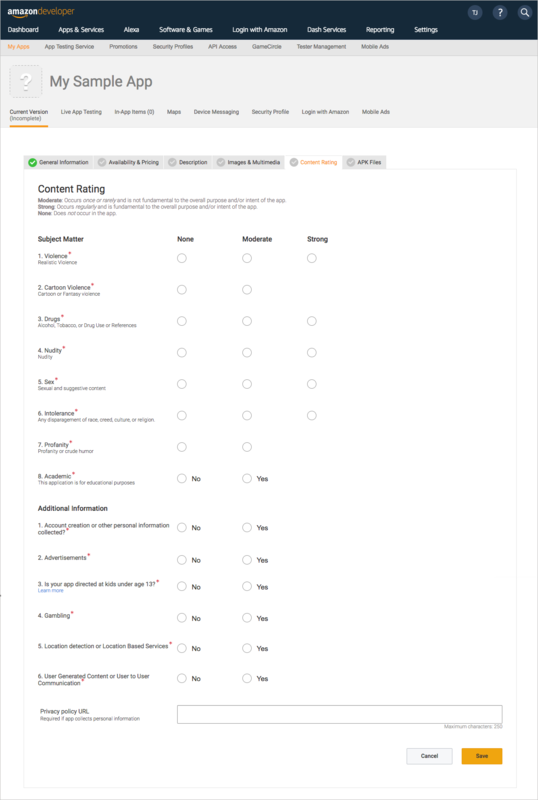 Use the Content Rating tab to define a content rating for your app. All apps published to the Amazon Appstore must adhere to the Content Guidelines that are described in Amazon Appstore Content Policy Requirements. If Amazon determines that an app contains, facilitates, or promotes content that is prohibited by these guidelines, Amazon will reject the app submission or suspend further distribution of your app and notify you at the email address associated with your developer account. Is your app directed at kids under age 14? For clarity about any category listed here, see Amazon Appstore Content Policy Requirements. For examples of policy violations, see the Examples of Amazon Appstore Content Policy Violations section. Based on your selections here, Amazon assigns a summary maturity rating to your app and then displays that rating on the app detail page. Amazon reserves the right to assign maturity ratings for your app at its discretion. If Amazon determines that an app contains, facilitates, or promotes content prohibited by these guidelines, Amazon will reject the submission. Note that content ratings for published applications can only be changed when submitting a new APK. If your app uses the IP of a third party, you might be asked to provide documentation of your license or IP rights to Amazon in order to list your app with the Amazon Appstore. This documentation must be either a confirmation letter from the IP rights holder with a formal signature or a copy of the applicable license agreement. Amazon will contact you during the app submission process to provide this documentation in a way that associates it with your app. If you're contacted for IP validation, send this documentation as an email attachment (not embedded images) to amazon-developer-program@amazon.com with a reference to your app submission, package name, and developer account. We will need this information to associate your documentation to the correct app submission and then pass it to the appropriate team for review.